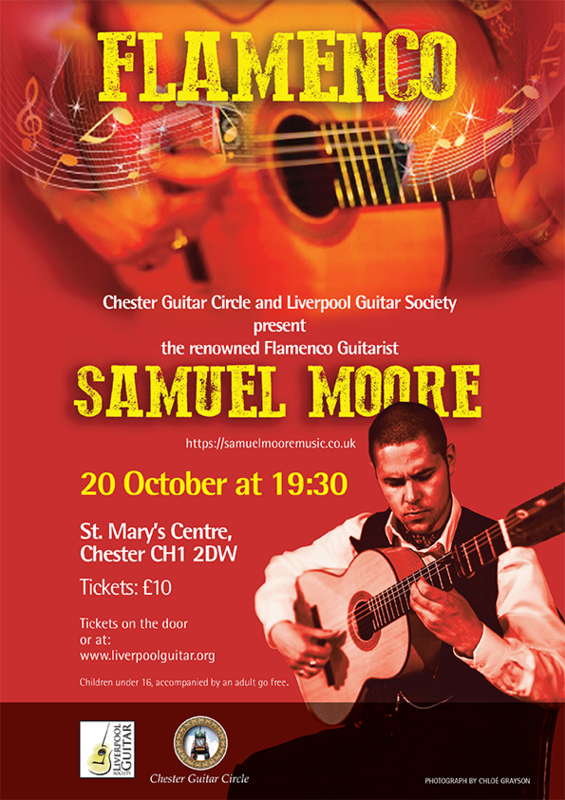 Samuel Moore is a highly experienced flamenco guitarist, was taught by Juan Martin, and has given numerous performances and workshops in the UK, Spain, US and Europe since 2007. 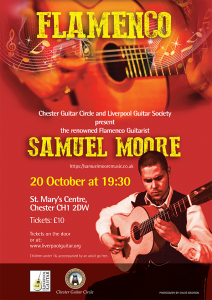 He has a classical guitar background but turned to Flamenco guitar and is therefore well suited to guide classically trained guitarists. Advance ticket sale has now closed, but we will still hold a number of tickets at the door. We are looking forward to welcoming Davide Sciacca at our next meeting on 23rd August. 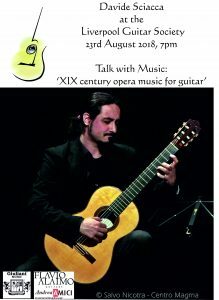 Davide will present a talk with music: ‘‘XIX century opera music for guitar’. Davide Sciacca obtained a Diploma with Honours in Guitar from the IMVB in Catania in 2008. In 2013 Davide was awarded a Masters in New Technology for Music and in 2015. He has studied with numerous renowned musicians including Andras Schiff (piano); Augusto Vismara and Christophe Grube (violin); Stefano Vezzani (oboe); and guitarists Carlo Ambrosio, Giulio Tampalini, Aniello Desiderio, Giovanni Puddu, Costas Cotsiolis, Philippe Villa, Amanda Cook, Richard Jacobowsky, Linda Calzolaro and Nello Alessi. Davide won more than fifty 1st prizes in international musical competitions including Amigdala, Magna Grecia, Benedetto Albanese, A gi Mus and AMA Calabria. In the years 2016 and 2017 he performed in the presence of Her Majesty The Queen, His Royal Highness The Duke of Edinburgh, HRH The Prince of Wales, HRH The Duke and The Duchess of Cambridge and other members of the Royal Family. Davide currently teaches Guitar and Tablature for Lute as part of the academic courses at IMVB in Caltanissetta, Guitar at IMPV in Caltagirone and he also teaches guitar in A. Musco high school in Catania, Sicily.